When living on a farm, generally you have the luxury of space on your side. Your chickens can run freely and there’s no real worry that you’ll come up short when all is said and done. But then again you have to consider whether any other animals can join them. Will the cats be a problem? How about a dog? Can a rabbit make things better or worse? Let’s take a look at some of the possible neighbors and see if any should be off limits. Most of the time when we’re thinking of pets, we’re thinking of cats and dogs. Farm cats and farm dogs actually get along with farm chickens just fine, within reason. 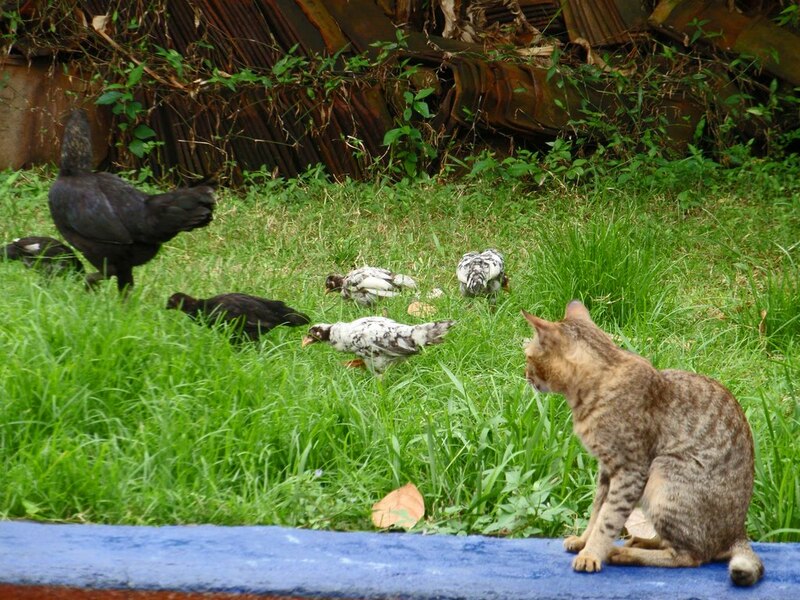 Oddly, you’d think that cats would become a major problem as they love to chase birds, and you will find the occasional bold feline looking to stir some trouble by running after their favorite bird, but on the whole they tend to leave chickens to their pecking and scratching. Do keep them separate from baby chicks though. Dogs are another story entirely. There are three categories that dogs fall into with the first being similar to the cat: live and let live. A lot more dogs will actually fall into the second category though where their protective instincts kick in and they’ll want to keep the flock safe from harm. Those are the dogs you most want around as they will actively keep predators away and seem to be most content when they’re on lookout. The third type of dog, the aggressive hunters, are very dangerous to keep around your chickens. Some dogs just have natural predator instincts that they can’t shut off, so when they see a chicken their first thought is to hunt and kill. You cannot mix these dogs with chickens, no matter what as they’ll injure them and tear up coops trying to get at their prey. Instead of the usual choices though, you might have a few rabbits that you’re interested in keep with your chickens, and as odd as it may sound, this isn’t necessarily a bad thing. In fact, keeping a rabbit in a friendly chicken coop can help give your hens something to focus on and stave off boredom, thus preventing nervous or anxious pecking. The smaller the animal becomes though and the more a new problem arises: Chickens can injure smaller pets. It all really depends on the aggression levels of your flock but in the wrong conditions you can have guinea pigs, small ducks, rabbits, and even tortoises on the receiving end of very nasty pecks and scratches, partly just because they’re in the way. Relaxed hens are less likely to be a problem, but it’s still a good reason to keep the smaller creatures away from the chickens. Other types of fowls, such as ducks, geese, turkeys, and pheasants, all do pretty well living near chickens as long as all roommates are non-aggressive by nature. There’s always the inherent risk of fights breaking out, but more than likely the biggest issue with keeping chicks and other animals together is the likelihood that they will each get into one another’s feed. If you’re breeding your chickens, it’s also good to keep them by themselves. The farm environment doesn’t necessarily have to be a segregated place but can rather allow many creatures to live in harmony. This of course only applies if said creatures wish to live in harmony. Keep an eye on your flock and watch for any reason to separate them from the rest!